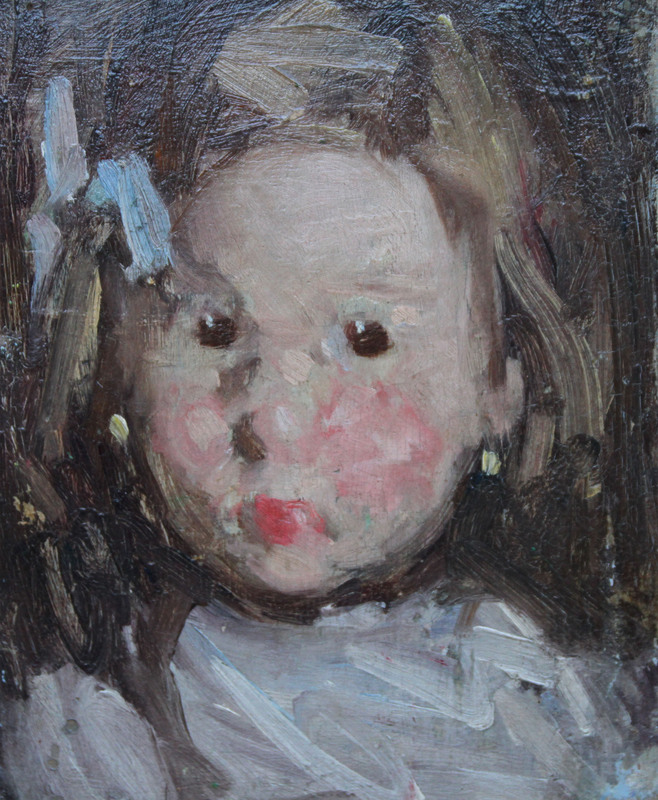 Portrait of a Child with Blue Bow. This petite but beautiful oil on panel portrait is by Norwegian artist Hans Dahl. 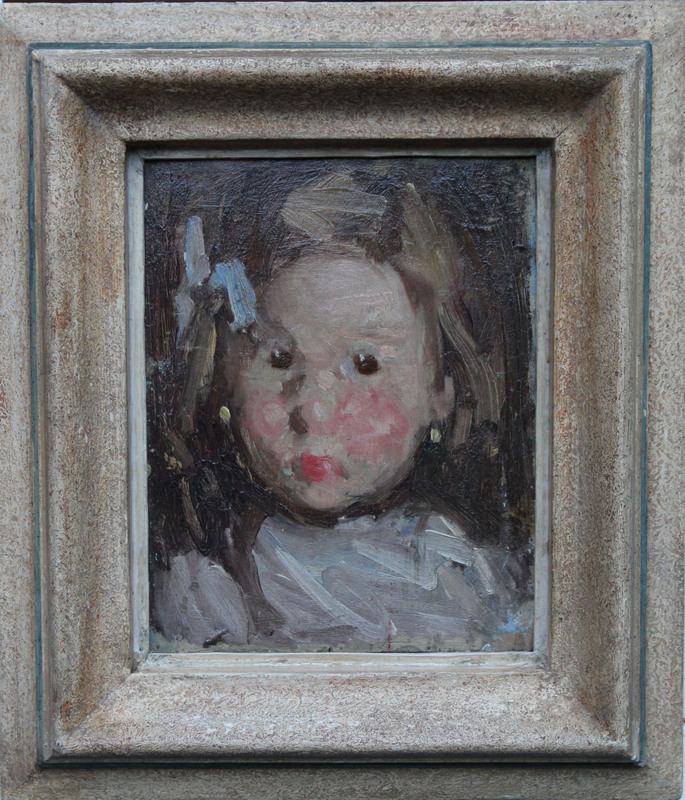 Painted circa 1890, the work depicts the head and shoulders of a ruby cheeked young child with a blue bow in her hair. The brush work is Norwegian Impressionist and free flowing with the highlights really capturing the little girl. A gem of a painting housed in a fabulous Bourlet frame. Housed in a beautiful Bourlet frame with a blue wash line that matches the little girl's bow 15 inches by 13 inches and in excellent condition. Hans Dahl of Hardanger Norway (1849-1937) was a Norwegian painter famous for his representations of Norwegian fjords and the surrounding countryside. He would often include seafaring men and lovely ladies in the middleground of his work. Dahl passed the greater part of his youth in the National Military Academy. A line officer in the regular army for several years, he resigned in 1871 to become a painter. He entered the art school at Carlsruhe, where he was a pupil of Riefstahl and Hans Gude. The latter instructor, being a fellow countryman, stressed the grandeur and beauty of Norway in his landscapes, and pictures by Dahl tend to convey the same flavor. The artist also resided in Dusseldorf where he studied briefly under E. Von Gebhardt and Wilhelm Sohn. Dahl had his first exhibition in Düsseldorf in 1876. Dahl travelLed and sketched extensively in Norway during the summer months. He also visited Paris, Berlin and London. Dahl lived in Düsseldorf until 1888, when he moved to Berlin. He died in Norway at the age of 88.